Low carb UK: Better results from low carb than lower fat. Better results from low carb than lower fat. There's a lot of chatter over the pond and on t'internet about a recent study comparing low carbohydrate diet advice with reduced fat. to examine the long-term effects of a diet low in carbohydrates, as compared to one low in fat, on cardiovascular disease risk factors, including blood pressure (BP), body weight and composition, serum lipids, plasma glucose, insulin, adipocytokines (adiponectin, leptin, resistin), and C-reactive protein (CRP) among obese adults. It is worth reading the full study, and the funding description, as there are various "interpretations" floating around. The same authors previously looked at the epidemiology of low carbohydrate diets and cardiovascular effects. In essence the two groups of obese women were given dietary advice and ongoing support over 12 months, one group was asked to limit "net carbs" to less than 40 grams a day and the other group was asked to limit fat to below 30% of calories with saturated fat kept below 7%. Clearly neither group did especially well on the diet after 3 months with both regaining weight, although the low carb people continued to improve their health markers. 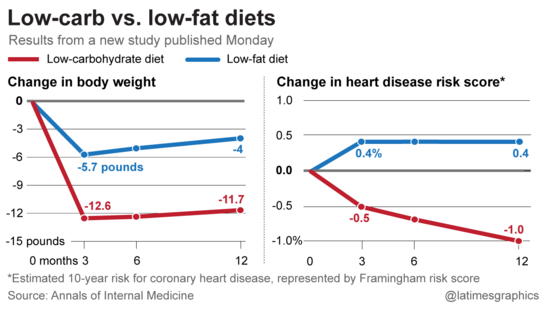 The low-carbohydrate diet was more effective for weight loss and cardiovascular risk factor reduction than the low-fat diet. Restricting carbohydrate may be an option for persons seeking to lose weight and reduce cardiovascular risk factors. The blogosphere then erupted with claim and counterclaim - some calling for low carb diets to be standard, others saying the low fat diet in the study wasn't low enough or the low carb was too high (as if these things would reverse the outcome). As always, a sane analysis was provided by Bill Lagakos who spotted that the low carb group continued to improve their body composition (reduced % body fat) despite some small weight regain. The error bars here are my own, showing approximately 1 standard deviation. Only at month 3 was the calorie intake difference statistically significant - 160 calories per day lower in low carb, P=0.046. 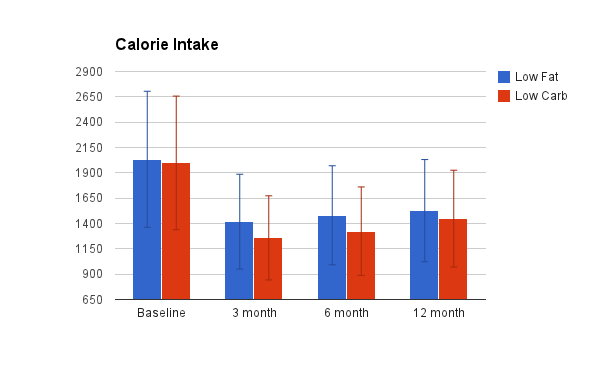 In both groups the average reported calorie intake after 12 months was at least 500 calories below baseline. It isn't easy to explain the weight regain after 3 months. Obviously there is a creep upwards in calorie intake but still a substantial deficit from baseline intake. Accuracy of self reporting is always an issue but it is worth noting that the baseline was not weight stable - it is possible that the subjects were all in a calorie surplus and gaining weight at the 2000 calorie baseline. What we did not see, once again, is the often promised "500 cals/day = 1 lb/week" beloved of the calorie worshippers. By this measure we're looking for at least 52 lbs weight loss in both groups - not <15 lbs in 3 months followed by weight regain. The average subject was about 97 kg weight with 40% body fat, using the Katch-McArdle formula gives a basal metabolic rate of 1630 calories so a maintenance intake of ~2000 is certainly feasible with sedentary lifestyle. At this point we run out of data and have to leave the question unanswered - "why did a large group of obese people regain weight while eating an average of 1500 calories which is below their BMR ?" The average daily fat intake at month 12 was 17 grams higher in the low carb group, about the same as at month 3. The daily "total carbohydrate" intake of the low fat group was 71 grams higher by month 12, p<0.0001, although by then the low carb group intake had crept up to an average 127 grams per day. Compliance with the study objectives was better in the low fat group than the low carb - the latter averaged 97 grams of total carbohydrate at month 3 which is double the stated goal of 40 grams of net carbs (fibre was about 16 grams throughout in both groups, below the stated goal of 25 grams. Total fat was kept below 30% of calories by the low fat group, but they didn't manage to get saturated fat down to 7%. Protein content of the two groups' diet was not the same, throwing another variation into the comparisons and providing ample arguments about the effect on the outcome. The low fat group reported <20% protein on calories and the low carb about 25%. When advised to limit carbohydrates a group of obese subjects achieved a higher weight loss and improved health markers after 3 months than an identical randomised group advised to limit fat intake. Which is another piece of evidence supporting the notion that reduced carbohydrate diets are an effective and healthy option for weight loss.